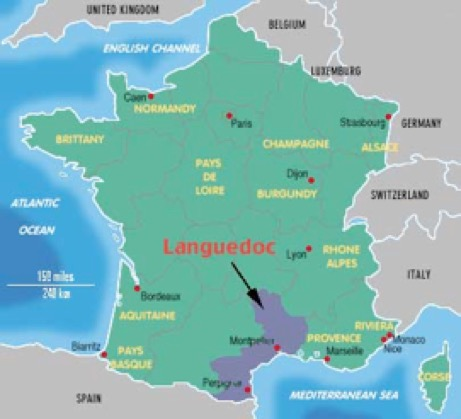 The Bondurant Family lived in the region of Rouergue and the Cevennes mountains of the Central Massif. 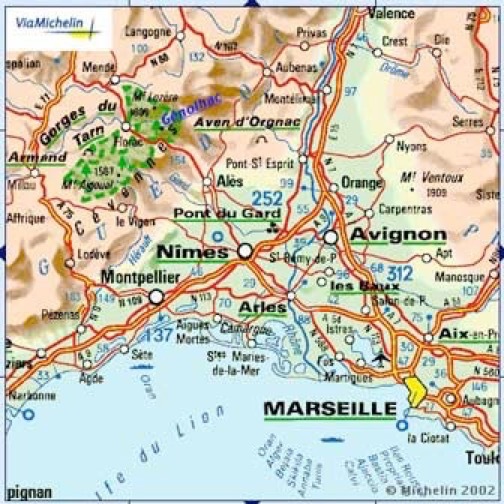 Historically, commerce traveled from the North of France to the ports on the Mediterranean Sea over an old Roman road called the Regordane Road. Our Bondurant ancestors moved to towns along this road such Vielvic, Genolhac, and Malhieres. The Bondurants ran inns on the road. The road passed down la Grand Rue in Genolhac and bisected Belle-Polle where a restored Bondurant inn resides today. 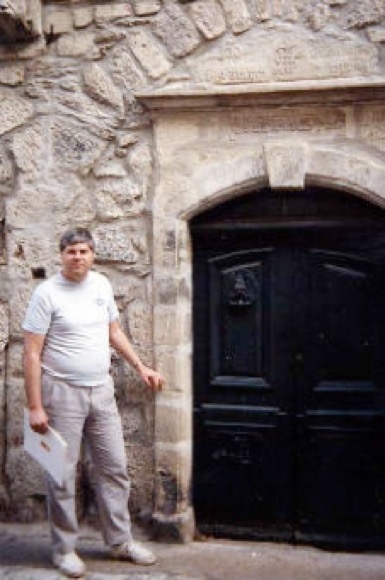 Jean Pierre Bondurant, our ancestor, lived in Genolhac in a house (shown below) on the la Grand Rue prior to escaping to America. Jean Pierre was born on 18 September, 1677 to parents, Jean Pierre Bondurant & Gabrielle Barjon. He was baptized as a Huguenot in the Genolhac temple and later baptized as a Catholic following the revocation of the Edict of Nantes. His parents died in 1694 and 1695. He inherited extensive land holdings including the house in Genolhac and two mills. 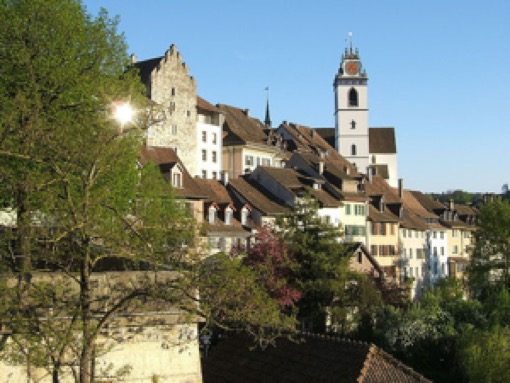 In 1697, he sold the two mills and fled the kingdom of France to join his uncle, Pastor Guillaume Barjon in Aarau, Switzerland where he recanted his Catholic faith. 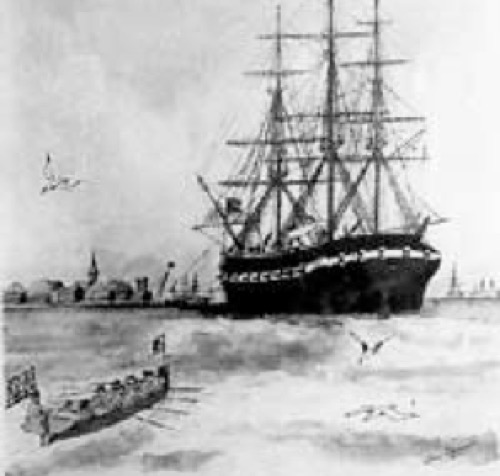 By 1700, Jean Pierre Bondurant had found his way to London, England and boarded the ship Peter and Anthony bound for America. On 20 September, 1700, the ship arrived at Jamestown, VA and the new arrivals were taken up the James River to the shoals (present day Richmond, VA). They settled initially in Manakin Town, a deserted Monacan Indian village. 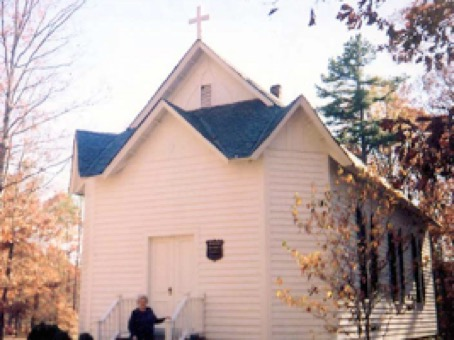 Jean Pierre attended the church in Manakin Town in the restored church shown below. It is located on the same site as The Huguenot Society Founders of Manakin Virginia and the Manakin Episcopal Church The address of this Bondurant Family historical site is 985 Huguenot Trail, Midlothian, VA 23113-9274. Jean Pierre died in 1734 and is buried in a graveyard on Birdsong Lane (Road No. 1217) near Powhatan, in Powhatan County, VA. His property was divided among his sons in his will filed in 1734. 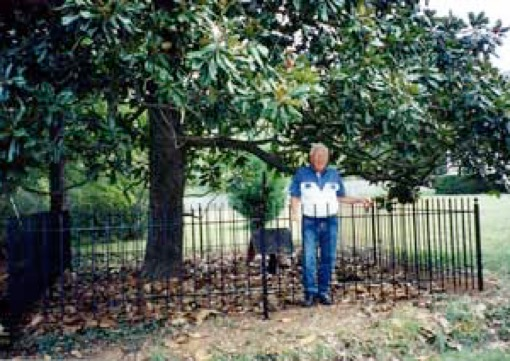 The Bondurant Family Association erected a fence and placed a commemorative plaque at the gravesite. In 1769 with John Findlay as his guide, Daniel Boone and four others went through the Cumberland Gap into Kentucky. In 1775, Richard Henderson forms the Transylvania Company and Daniel Boone acts a their agent to purchase land from the Cherokee Indians. Boone and his companions build a fort at Boonesborough, KY by the first of May 1775. 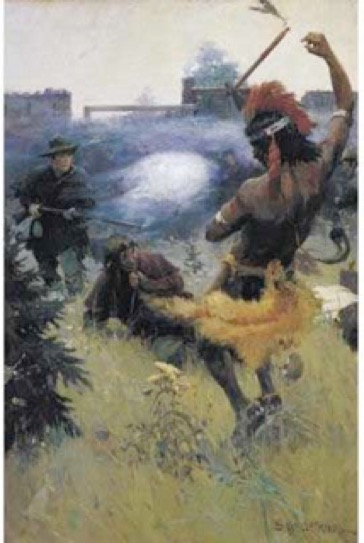 David Bondurant had come into Kentucky District, and had made a settlement in February 1778 on “Tate’s Creek about three miles from the mouth thereof including the Walnut Bottom,” an area now part of Lexington, KY. September 1778, under the guise of signing a peace treaty with the whites, the Shawnees gather at Fort Boonesborough. They besieged the fort from 7th to 18th September, but the settlers held on, with only two casualties – DAVID BONDURANT, and London, a male slave of Col. Richard Callaway. After the Revolutionary War, the Western US was being opened up to civilization by the likes of Daniel Boone, who helped mark the path to Kentucky through the Cumberland Gap. 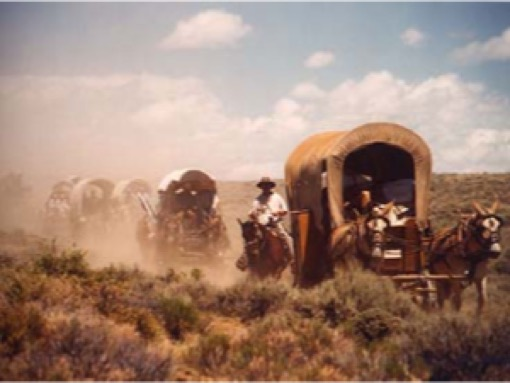 Numerous families went west to find their fortunes in farmlands of the mid-west and the mountains of the west. During a presentation on Westward Migration of the Bondurant Family at the 2002 Annual meeting, David W. Bondurant traced four families migration westward and in the process documented the founding of two Bondurant towns, Bondurant, IA & Bondurant, WY. 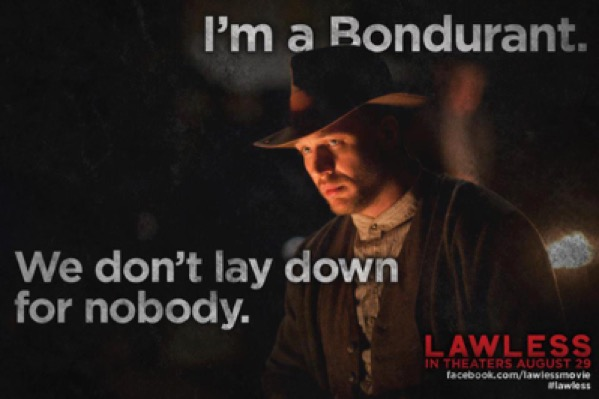 The movie “Lawless” was released in August 2012. It tells the story of the Bondurant Boys (Howard, Forrest, and Jack) of Franklin County VA who were involved with moonshining during Prohibition. The movie is the real life story of Jack Bondurant as told by his grandson, Matt Bondurant in his book “The Wettest County in the World”. The genealogy of Jack Bondurant in the movie is shown in BFA Newsletter Issue 95. Jack Bondurant's son is former treasurer of the BFA, Jack Bondurant. Joan Bondurant graduated from the University of Michigan and studied Japanese language. One of her professors formed the Research & Analysis section of the Office of Strategic Services (the forerunner to the CIA) in San Francisco to analyze Japanese documents early in WWII. Joan and another Michigan graduate went to work for the OSS. They were later assigned to the R&A office in New Delhi, India to analyze Japanese military messages. In addition to this assignment, Joan was involved with monitoring the growing independence movement in India by meeting with important Indians. Through this activity, she met Mahatma Gandhi. When she returned to the US, she received a PhD in International Studies from University of California, Berkeley where she became a professor and leading authority of the Gandhi Nonviolent Protest philosophy.